The Kestrel Australia website project threw up a number of challenges. During the initial exploratory stages, we were presented with multiple Excel documents - each document specific to a single product type across Kestrel's range. This is how Kestrel (and their competitors) produced a quote for a customer. A "sliding door" in quoted differently to a "security door". A "glass shower screen" is quoted differently from a "wardrobe door". So with all the options laid out on the table, we realised each product, on average, had around 80 possible options to choose from - some had much more! A customer needed to be able to select the correct size and dimensions of their desired product. These choices needed to all dynamically affect the price. There were also "optional add-ons" - each product type had a unique (often totally unrelated) set of options available to it. Allowing the customer to easily pick and choose options to add to the base product was seen as a huge plus. Finally providing meaningful colour choices to the customer was important also. Many products in Kestrel's range could come in a huge range of colours - often different colour choices affect the price outcome. Kestrel wanted a system that provided immediate visual feedback on price. As the customer selected the many options available to them the quotation price had to dynamically change to represent these choices. A customer could determine their most desired options and pick and choose appropriately based on their budget. Of course, the site had to work seamlessly across devices - desktop, laptop, tablet, and smartphone. After extensive prototyping and great participation and feedback from Kestrel, we began the development of the site. Because it was so specialised we needed to create a bespoke system that was able to handle the complexity of the product types. No "off the shelf" shopping system was going to be able to accommodate the large and detailed features required for this build. We chose ExpressionEngine as the framework to build the site. ExpressionEngine is a great framework which gives us total freedom when building out the interface designs. A great strength of ExpressionEngine is it places no constraints on the design of the data and any “required” layout to accommodate that data. We consistently find ExpressionEngine more flexible, powerful, and extensible than anything else out there. The end result is a triumph of considered information design. Through a clear and uncluttered interface, customers can configure multiple products and add them to their "quote cart". Once they are happy with all their choices the submit the information to Kestrel with a single click. The quotation requests are sent trough to Kestrel and collected in a custom developed backend management system. The quotation/order process can be easily managed by Kestrel, and the status of each order changes depending on where it is in the process. Different stakeholders at Kestrel see different views of the backend depending on their access/permission levels. Kestrel can easily manage their product catalogue via the backend management system. 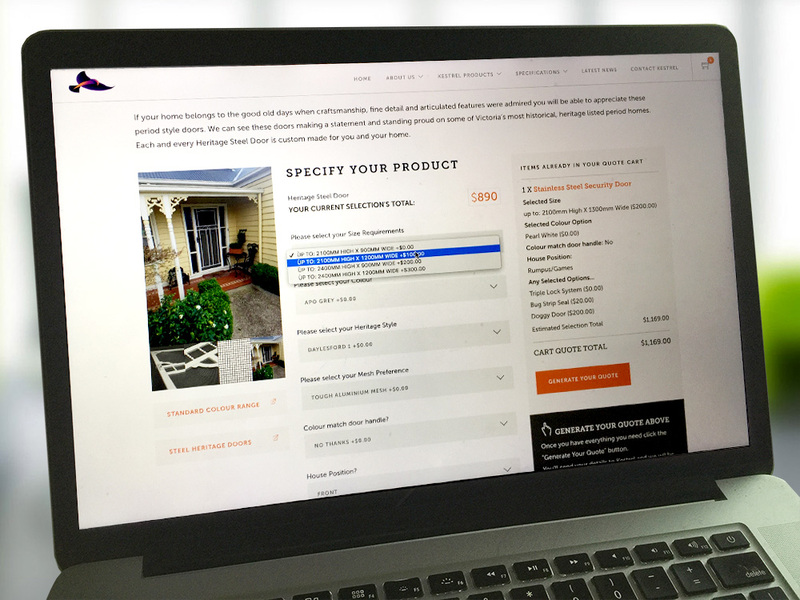 A totally unique, complex product with literally hundreds of options (which all affect the final price) can be created easily and simply by staff at Kestrel. Even for a complex system like this training Kestrel staff took no more than an hour. Thanks to the streamlined backend Kestrel sees only what they need to see. Feedback from the company has been incredibly positive. As we developed the site and previewed our work to the stakeholders at Kestrel it became apparent that the site could become a great tool for Salespeople out on the road also. With a few minor modifications to the system Kestrel's sales team now carry around an entire product catalogue and dynamic price list on their smartphone. As a salesperson out on the road submits a quote the system records which particular salesperson generated the quote and tags them to the customer record. And finally, once a quotation request is converted to an order it can be easily exported from the system directly into MYOB (Kestrel's preferred accounting package) and generate an invoice for the customer once the quotation is accepted.